House-sitting and happy in Seattle until we leave again in February. House-sitting on lower Queen Anne just around the corner from the house we sold a year and a half ago is the perfect setting to reflect on our Senior Nomads travel during 2016. It has been enlightening. Michael and I spend so much time moving forward that it’s nice to take a moment to look back. And what a view! Both from this house and in the rear view mirror. Although most of our adventures have been covered in our blog, here are my musings on 2016 as a whole in two parts (read Part 2 here). 16 Countries and 40 Cities! We started 2016 in sunny Mexico City, followed by ten days in San Miguel Allende. A warm-up act to spending most of February in Cuba. What a fascinating country. It took me three blogs to cover our experiences using Airbnb in five cities - worth a read if you are thinking of going there. We moved on to Paris, of course, to see our family and spend Easter with the littlest grand children. From there we headed to the South of France to Aix-en-Provence (I could have stopped the whole trip right there!) and then on to Pezenas. We crossed into Spain for some time in Gerona in the Catalonia region - a beautiful and overlooked corner of the world. Then, to add another country more than any other reason (one of the joys of being nomads) we trekked to the tiny country of Andorra by bus. We were high in the magical Pyrenees mountains in a fairy-tale city. Next stop Croatia - our favorite country. We spent five weeks with stays in old favorites Split and Hvar, and added a week in Zadar, a new place to love. All ready to roll at the train station in Lausanne, Switzerland. For a complete change of scenery we landed in Dublin, Ireland for a few days on our way to a two week stay in the postcard-perfect coastal town of Galway. Next up was London for the week before, and the week following the Brexit vote. We stayed in an adorable little house in a secret garden in Peckham-Rye - a place most tourists would avoid (but shouldn’t). 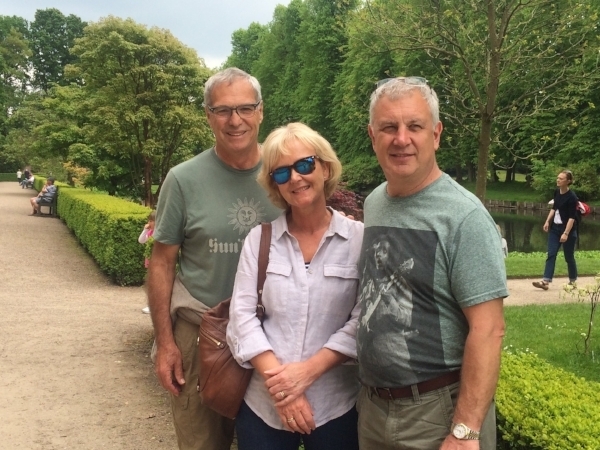 Back to Amsterdam because we love it - and then to The Hague where we connected with Mary and the our three French grandchildren for a week near the sea. We were with all five grandchildren (a first) in Los Angeles over Thanksgiving. What a treat! Now we were ready to get into the thick of things - Eastern Europe and beyond to the Caucasus Region. Michael has wanted to visit this part of Europe since we first planned our travels over three years ago. First up beautiful Krakow, Poland. An easy start to this leg - except for the fact we hadn’t considered we would be there during World Youth Day. That would be days, in fact. We were joined by 400,000 singing, praying, hepped-up-on-Jesus Catholic youngsters - and the Pope. We left Krakow stuffed in a Blah-Blah car - a ride sharing service and a new experience for us! Our host driver dropped us in Lviv, Ukraine and waved good-bye. Gulp. Lviv was a sleepy city, just waking up from a long winters nap (and some serious oppression). On to Kiev - where we got our fill of post-Soviet history and learn all there is to know about revolutions, espionage, dastardly deeds and nuclear disaster since one of our days was spent stomping around in Chernobyl. Just one of the eerie, abandoned places we walked through in Chernobyl. On to Minsk the capitol of Belarus - definitely off the beaten path. We spent a day with the family of a friend so had some very insightful experiences around daily life in this former Soviet Republic. Since visiting as many former Soviet Republics as we could was the ultimate goal - we headed to Baku, Azerbaijan. What a stunning, opulent, oil-rich enclave that city turned out to be. We spent a week in Tbilisi, Georgia. Then on to our final stop on this tour, Yerevan, Armenia - a surprisingly cosmopolitan and beautiful place. That was enough of deep thought and dark times - so, time to go to the island of Sicily! I'm standing on a mosaic floor created 2,000 years ago in Villa Romana del Casale. olive grove. Our last stop was Trapani, where we took a gondola ride high into the clouds to the amazing medieval city of Erice. It was so good to be back under Italian skies - and in food heaven. We left the island behind with a commitment to return and headed to mainland Italy - a place we just can't get enough of. We started in Rome, with stops in Florence and Milan and, new for us, Genoa. If it’s possible, we finally had our fill of gelato, pasta, real pizza, fine art and historical monuments. One last stop in Paris and these Senior Nomads were ready to return to Seattle! Make New Friends But Keep the Old: Our Airbnb lifestyle gives us the privilege of meeting so many interesting people - certainly our hosts, but often times their families and friends as well. Not to mention the many strangers we meet along the way! Many of our acquaintances have turned into lasting friendships - we spent time with some of our first hosts in Greece during a 6 hour layover in Athens, we stayed for three days in Rome with our hosts from Cyprus who have a home there, spent a lovely evening with our good friends in London, and in Wales we stayed with friends we met in 2015 on a 7 day cruise out of Kotor, Montenegro. Our friends the Cluttons who we met in Montengro hosted us for a few days in Wales. We also connected with friends hwo live near Amsterdam who were former slip mates of ours at Elliott Bay Marina. Maybe the craziest reunion was with long time Seattle friends who heard us on the radio on their rental car in Ireland! They pulled over and called Michael's cell phone and it turned out they were staying walking distance from our Airbnb in Galway. A few nights later we were having dinner together! And finally a few weeks ago in L.A. we reunited with a couple we shared an Airbnb with in Trinidad, Cuba at the start of the year. We made new friends young and old everywhere we stayed in Cuba. We made friends we'll stay connected with in Havana, Galway, Zadar, Andorra, London, Split, Syracuse, Tbilisi, Baku and Minsk! By sharing daily events from shopping in the market, to a sunset boat ride, a dinner out, a thrilling football match or just swapping stories over a cold beer on the patio, it's the people that make this way of traveling so rewarding. Seeing things differently: The pace of our travels allow us to deviate from a typical tourist itinerary. Let’s start with holding our personal Geiger Counters while we ducked into abandoned buildings and crossed eerie landscapes in Chernobyl - site of the 1986 Nuclear disaster in Ukraine. Then there was foraging for daily supplies with our hosts in Cuba - that was eye-opening. We ate smoked salmon and delicate tea-cakes with Gin Fizzes at a ladies lunch at our host’s mother-in-law’s home in Galway. 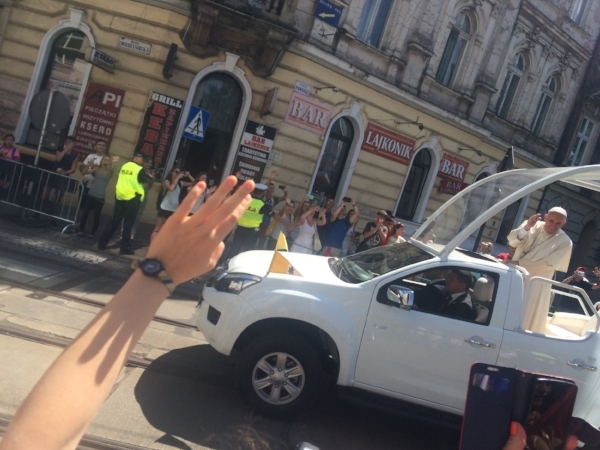 In Krakow we immersed ourselves in the happy antics of World Youth Day and saw the sights through fresh eyes, and we waved to the Pope! I fought my way to the front of the crowd to catch a Pope moment in Krakow, Poland. We came across an international choir competition in Zadar that led to several impromptu concerts. We climbed like mountain goats in and out of cave dwellings in Georgia -with a stop in Stalin’s home town and a tour of the museum chronicling his life. In Catania we joined a protest parade against the former Italian Prime Minister, Matteo Renzi, because we are forever curious and anxious to learn. Michael finding out just what we are protesting as we joined the march in Catania, Sicily. In Minsk we took a peek inside a moonshine operation hidden under the floorboards of the porch of a friends farmhouse. We watched the New York Metropolitan Opera “live” on the big screen in Aix-en-Provence and afterwards the new Apple Store where we had a genius bar appointment! I spend most of one day in the Aquarium in Genoa - most of which sits inside a re-fitted tanker. A highlight in Amsterdam was a joint exhibit of the work of the infamous British street artist Banksy and our own Andy Warhol. That led us to a tour of the street art of Paris that stretched over three days as part of Airbnb’s new Trips program. It was amazing. And of course there was football - Michael continued his quest to attend as many matches as possible. On this round he was able to see matches in Mexico City, Split and Baku (a great outing with our host). In Florence, he even convinced me to join him to see local Fiorentina play world famous AC Milan. 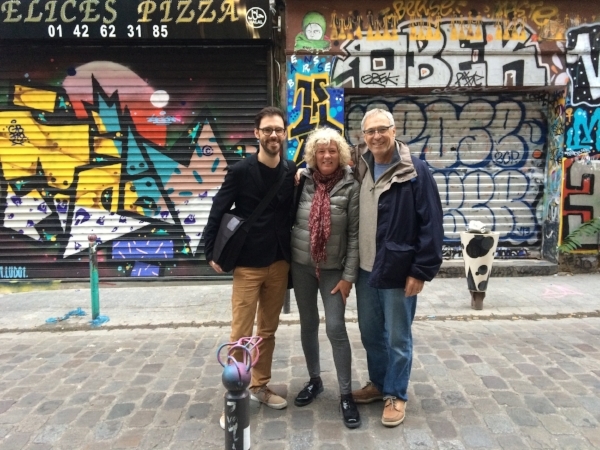 Taking a tour of Parisian street art during a Airbnb Trips experience. There is more to tell about our 2016 travels in Part 2 including some insights on what we've learned this past year and where we're headed next. And of course there are more stories about each of our destinations in previous blogs. Thanks again for following along and Happy New Year!